The Gstaad – come up & slow down! Do you want to know what’s place is popular among world celebrities? We have an answer – Gstaad. This destination is truly regarded as one of the prestigious resort of Switzerland. Gstaad has become a brand today and this brand is synonymous with stylish charm and discreet luxury. You are awaited by 220 km of pistes at altitudes of up to 3000 metres above sea level, 170 km of trails classic– and skating-style cross-country skiing will be at your disposal. Are you interested? We are. We decided to meet closer with Gstaad and Bauer Vivienne, ex – Assistant PR of Gstaad Saanenland Tourismus, and Fiona Romang, Privat Ski Teacher and Guide of the region, agreed to answer our questions. – Fiona, could you introduce Gstaad, tell about its location and history of foundation? Gstaad is a beautiful little authentic and traffic free village which has kept its charm with all the typical wooden Chalets all over the Saanenland. Outside the village we have five picturesque valleys where we can do nice walks on winter trails, go cross-country skiing and snowshoe walking out in nature. Gstaad is also an alpine wellness centre with many different & gorgeous facilities. Besides a big range of hotels and typical restaurants there are boutiques and shops in town. The first tourists arrived around 1905 after the MOB Train was built between Montreux & Zweisimmen. Later parents visited their children who stayed in one of the International schools in Gstaad or Saanen. The region has a further 9 chalet villages alongside Gstaad, located at an altitude of between 1,000 and 1,400 metres. According to legend, God wanted to take a short rest whilst creating the world. The imprint of his hand thus shaped the Saanenland region. His five fingers formed the valleys, with Gstaad nestling in their midst. It is hard not to believe that supernatural forces are at work when you let your eyes wander over the beauty of Nature. And nestling amidst the lakes and mountains lie the homely, Alpine villages with their characteristic chalets. Or as acting legend Julie Andrews once said: «Gstaad is the last paradise in a crazy world». – What can you say about Gstaad’s slopes and peculiarities of skiing there? The whole region has 53 lifts and cable cars to ski on over 220 km of prepared slopes. The top of the mountains are between 1500m and 3000m and the slopes are from easy blue runs to more difficult black ones. The area is ideal for beginners and intermediate skiers but also experts find black runs or free ride slopes and helicopter skiing with our local mountain guides. As Gstaad is not a very high resort trees grow nearly to the top of the peaks which makes the runs pretty and practical because we also ski on a snowy day as the visibility stays good near trees. The fun park in SaanenmÖser for snowboarders and skiers is lots of fun for the younger generation. There is tobogganing on different mountains in the area from easier to difficult runs and the highest tobogganing lop of Europe is on the Glacier 3000. – Will snowboarders and free riders find facilities for themselves? Skiers and Snowboarders ride on the same slope. Free riders have beside the yellow signed off-piste slopes the possibility to enjoy a heliskiing tour. In the Swiss Snow League you will learn the ski and snowboard sport from the scratch. As a beginner you will get the basic of the sport in the Blue League. Later you will improve your skills in the Red League, before you will become an expert in the Black League. – How many months does ski season last? And what is the size of snow cover there? 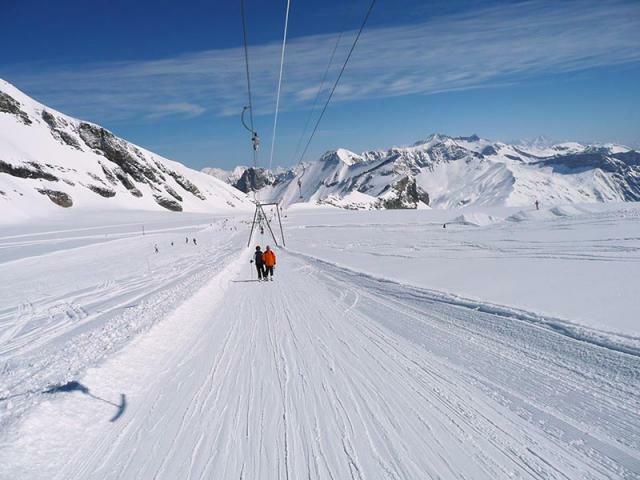 Our ski season usually starts mid December to beginning of April and on the Glacier 3000 from End of October to mid May. In winter snow is guaranteed 100%, but up to 60% artificial snow is possible. – Vivienne, what can you say about accommodation facilities? Shall we find there mainly hotel, residence and/or chalet? Gstaad has a long tradition of hospitality, proudly upheld today by over 90 hotels. Guests can also choose from a wealth of holiday apartments, chalets and Bed & Breakfasts to suit every taste. An architectural work of art sits high on a hill, lording over the charming village: the legendary Gstaad Palace – the hallmark of the region. It is one of the oldest and most venerable five-star hotels and regularly ranks among the best hotels in Switzerland. It’s a combination of discreet luxury, family homeliness and understated service and attention is the epitome of the entire holiday region of Gstaad. – What does the resort offer for youth? We can offer a large amount of nightlife, besides skiing, snowboarding, tobogganing and other outdoors. – Will the resort be glad to host families? Families really feel at home in the holiday region of Gstaad You're sure to find an offer tailored to your needs offering the variety you require. – Fiona, we know Gstaad is a well-known destination among famous people. Tell us, what tourists can we meet there? Gstaad is not only for celebrities, it’s also well known for guests from all over the world; everybody is very welcome in our special region. As Gstaad is only 1050m high, it’s a healthy and ideal region also for those who are not used to heights or who have heart conditions. Our guests come from Germany, France, United Kingdom, BeNeLux, Gulf Cooperation Council and even China. – What about entertainment? Can you offer some social and sports events to visit? Or where your guests can relax after eventful day? Most events are held during the summer months like Beach volley & Tennis tournaments, the world known Menuhin Festival as well as the Polo tournament in Saanen. Mid January the great winter games are held as well as the «Sommets musicaux» (classical music event). For aprÈs ski you find different Bars with or without music on the mountains as well as in the village. – Is it difficult to get there? The Gstaad holiday region is located in the south-west of Switzerland right on the border to the French-speaking part of the country. The region is easily accessed by rail or car from the regions around Lake Thun and Lake Geneva and the Gruyere region. Direct connections to the European high-speed rail network and all international airports in Switzerland guarantee a time-saving and pleasant journey. – Do you have some special offers for Ski-pass purchase for different categories of tourists? Yes, we offer different kinds of ski-passes: adults, youths (1991-1998), children (1999-2005), small children up to 9 years (<2006) travel free of charge on the mountain railways.